A wealthy Tunisian merchant; died Jan., 1785, at an advanced age. He devoted part of his time to rabbinical studies, and in 1752 succeeded his teacher, Isaac Lumbroso, whose best pupil he was, as rabbi of the Leghorn congregation of Tunis. Throughout the country he enjoyed a high reputation as a rabbinical authority. His publications are: "To'afot Re'em" (The Strength of a Unicorn), commentary on the work of Elijah Mizraḥi (Leghorn, 1761); and "Mira Dakya" (Pure Myrrh), commentary and miscellanies on various tracts of the Babylonian Talmud, and on Maimonides' Yad ha-ḳazaḳah (Leghorn, 1792). 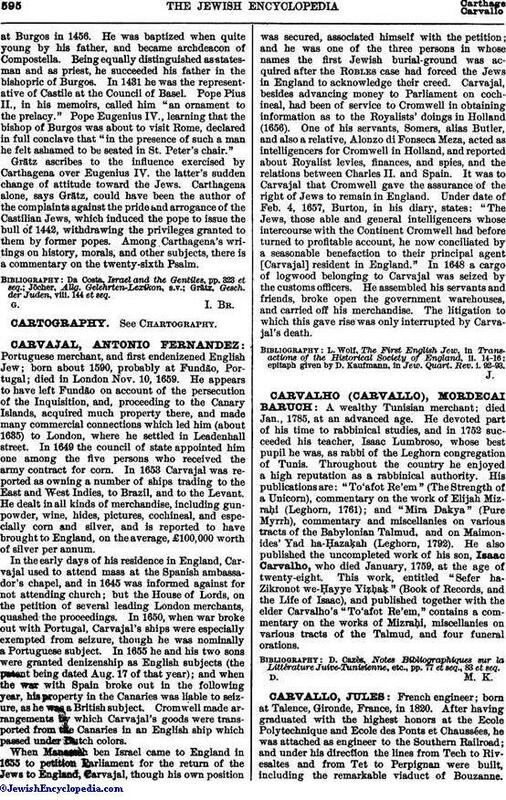 He also published the uncompleted work of his son, Isaac Carvalho, who died January, 1759, at the age of twenty-eight. This work, entitled "Sefer ha-Zikronot we-Ḥayye Yiẓḥaḳ" (Book of Records, and the Life of Isaac), and published together with the elder Carvalho's "To'afot Re'em," contains a commentary on the works of Mizraḥi, miscellanies on various tracts of the Talmud, and four funeral orations. D. Cazès, Notes Bibliographiques sur la Littérature Juive-Tunisienne, etc., pp. 77 et seq., 83 et seq.